Exquisite thyme honey from the mountains of Crete, with a particularly high content (60%) of thyme pollen grains. It should be noted that according to the existing European legislation (Code of Food and Beverages, article 11), any honey with a thyme pollen grains content of at least 18% can be called ‘thyme honey’. 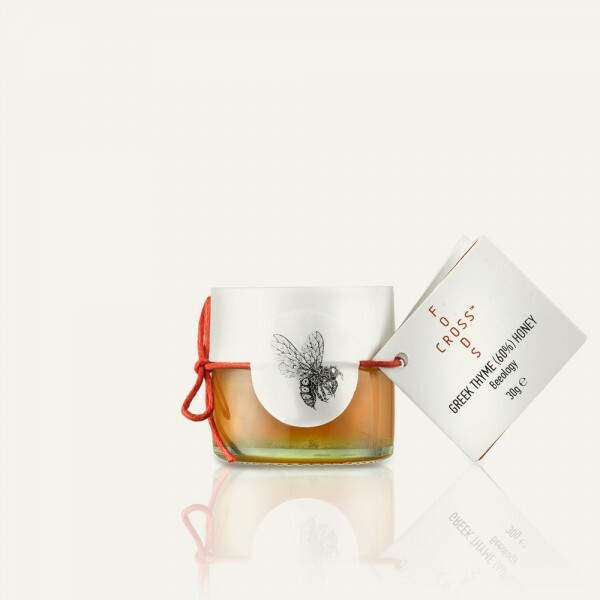 Offered with care and respect for the time frame defined by nature alone, FoodsCross thyme honey comes from traditional beehives, free from additives of any kind and without mixes with other types of honey. Particular care is placed on the product’s natural storage under dry and shady conditions; the absence of any heat treatment during bottling guarantees that the honey’s pure composition is kept intact. The packaging process is characterized by conditions of high hygiene and exceptional design. Every jar is manually tested and sealed, and every security strip is carefully placed by hand. This honey is of dark orange color, with a pleasant taste and spicy after notes thanks to its high fructose concentration. Due to its toning and antiseptic properties, this honey helps prevent cardiovascular disease and acts beneficially on conditions of the urinary, respiratory and digestive systems. It contains a series of amino acids (proline, phenylalanine, tyrosine, valine) minerals and vitamins (C, B6, riboflavin, pantothenic acid, calcium, phosphorus, magnesium, sodium, potassium, iron, zinc) and is particularly rich in metals like copper and iron.